Sirius is the brightest star in the sky (except the Sun of course). 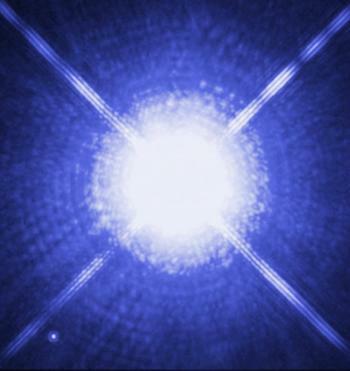 It is a double system of a hot blue-white main sequence star (Sirius A) and a white dwarf (Sirius B). Actually Sirius B was once the bigger of the two, before it pushed away its hull. To the lower left is Sirius B.